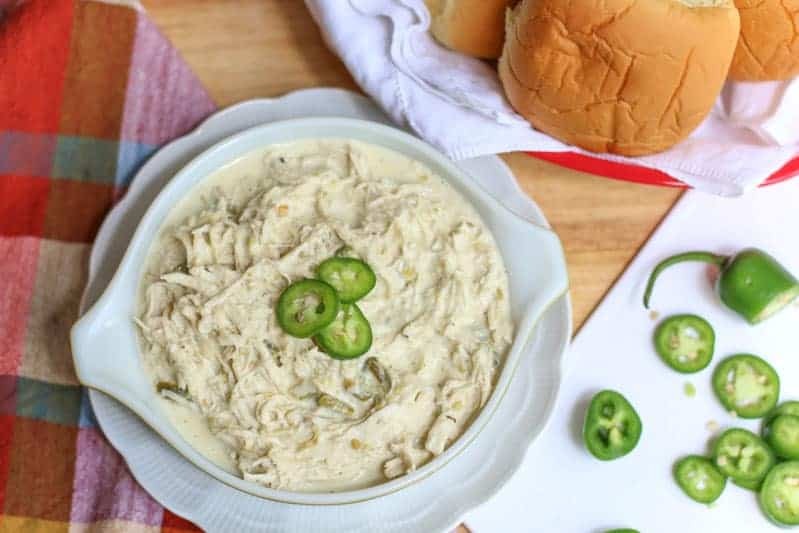 This easy Instant Pot Jalapeno Popper Chicken recipe can be made in under 30 minutes. The jalapeno popper chicken is cheesy, spicy, and incredibly flavorful. Add the shredded cheesy chicken on a bun for a sandwich or eat it plain for a low carb option. Either way, this jalapeno popper chicken makes a fantastic dinner option that all jalapeno fans are sure to love. If you have been reading my blog for a while, you know I LOVE jalapeños! The more spicy the merrier. My Cheesy Jalapeño Cheddar Beer Bread, Jalapeño Chimichurri Sauce, and Fire and Ice Pickles are some of my favs! I also love jalapeño poppers soooo…. I decided to make this Instant Pot Jalapeno Popper Chicken for something easy to make for dinner that had amazing flavor. I mean, chicken + cheese + jalapenoes= YUMMMM, right?!? This recipe is so easy to make. You basically dump everything in the Instant Pot and shred the chicken to absorb the sauce. Not hard, right? For me, the hardest part about creating this Instant Pot chicken recipe is not digging into it and eating it as I was taking the pictures for this blog post. It is so creamy and cheesy. The jalapeños with the cheese really bring an incredible flavor to the chicken. If you don’t want it spicy, just remove the seeds. If you want it more spicy, add more jalapeños. I add some extra fresh ones in for jalapeno spice and flavor layering. 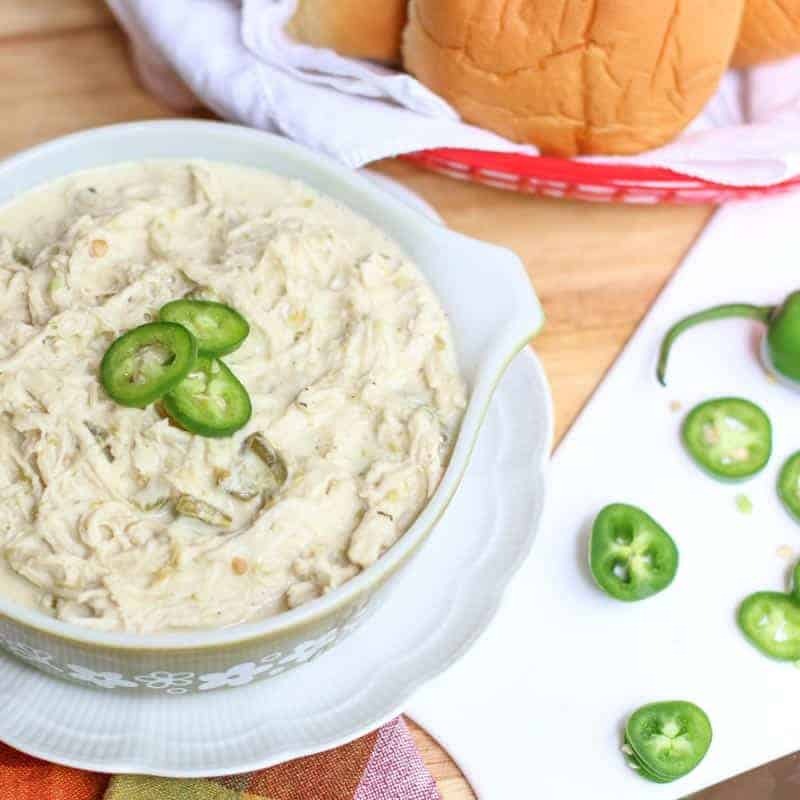 This Instant Pot jalapeno popper chicken is great on little potato or Hawaiian rolls. You could whip up a batch or two for sliders for your next party. My husband is on a healthy kick and didn’t want to eat it on bread. It really is amazing by itself, but I sautéed some spinach and topped it on that for him. He LOVED it. He said the flavor combinations were incredible. You could also add it to some lettuce wedges if you want. Either way, the recipe is low carb. You can eat it how you want and you will love it in all variations! For more Instant Pot recipes check out: Instant Pot Mexican Chicken Soup, Instant Pot Cheesesteak Sloppy Joes, and 15 Minute Instant Pot Salsa Verde Chicken. 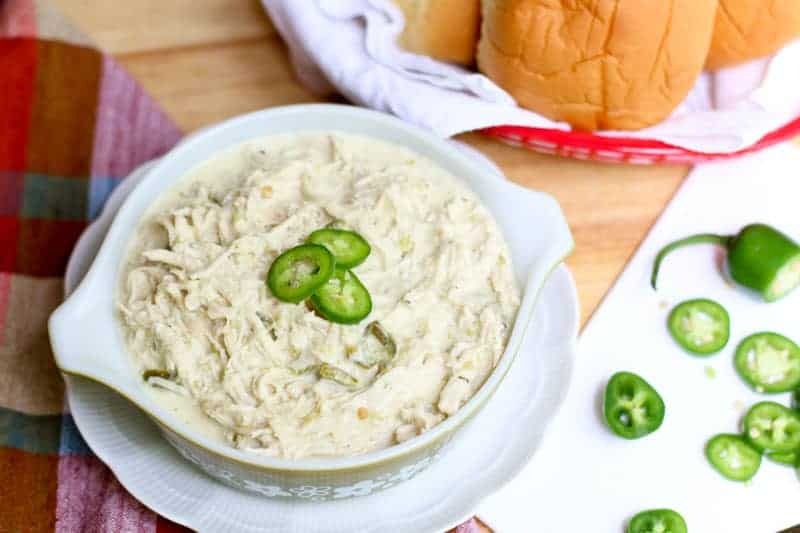 This easy Instant Pot Jalapeno Popper Chicken recipe can be made in under 30 minutes. The jalapeno popper chicken is cheesy, spicy, and incredibly flavorful. Add the shredded cheesy chicken on a bun for a sandwich or eat it plain for a low carb option. Mix water and ranch. Add to Instant Pot. 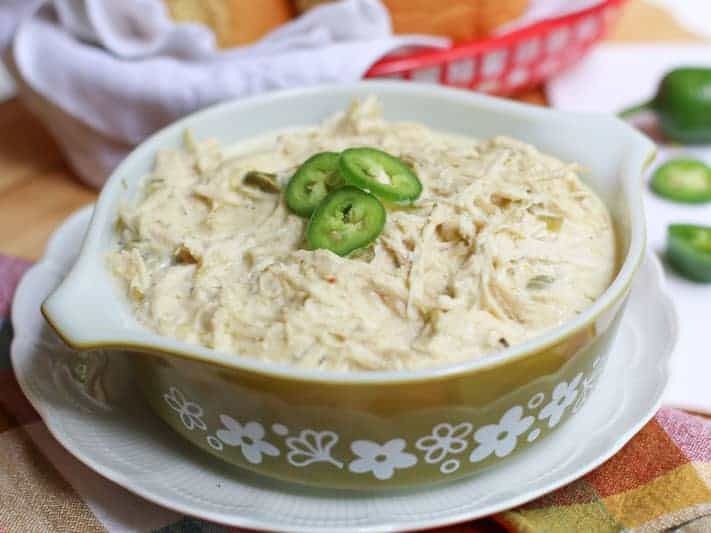 Add chicken breasts, cream cheese, diced chilies, and jalapeno. Cook on Manual High for 10 minutes. Natural release. Shred chicken and mix chicken in sauce. Add in Monterey Jack cheese. Saute for 5 minutes, continuously stirring to prevent scorching. Cool for 5 minutes and serve. This looks very tasty, I have been looking for some bun fillers that are low in carbs. look forward to giving these a go! I can see this being tasty in sandwiches. I love the fact that this recipe is so easy with a short list of ingredients, yet it has so many flavours packed in! Really need to try this one. You will love it. It so wicked good. Happy Mother’s Day! I am excited for you to get your Instant Pot. It is a game changer in the kitchen. I’m getting an Instant Pot for Mother’s Day. I’m pinning this to try ASAP! Looks amazing!